Every year, we get together with family and friends and volunteer to help with the Haunted Happenings haunted trail at Kennekuk Park, IL, and this year, Ginny came along. Yes, I realize Halloween was over a month ago. And yes, I realize we’re all knee deep in Christmas preparations. 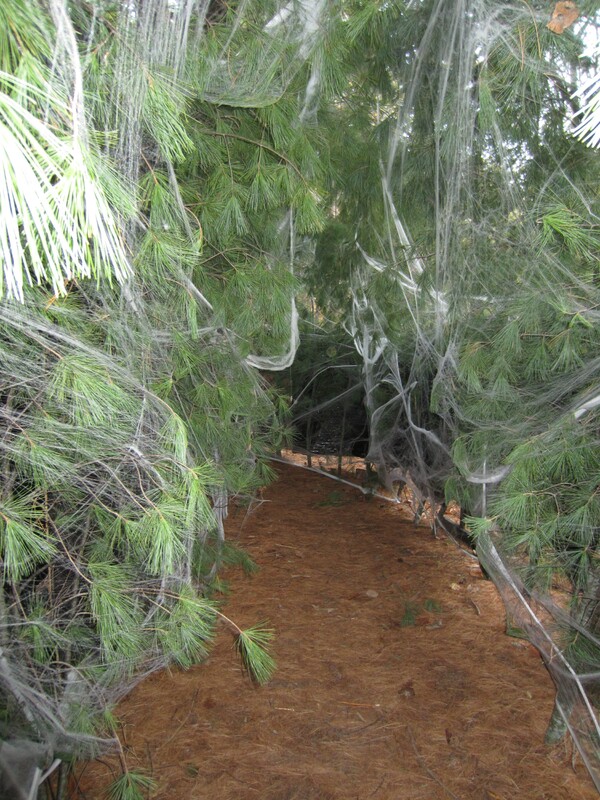 And no, the “spook walk” through the woods isn’t held in December. We did this the weekend before Halloween. I’m just really, really late in posting this blog. But I just can’t skip this, because Ginny’s Big Mama ride was just too priceless! Almost every year, we have a spider scene. In fact, my father-in-law is known for his spiders throughout the county. We keep adding to the scene, and making it a little better during each Haunted Happenings event. 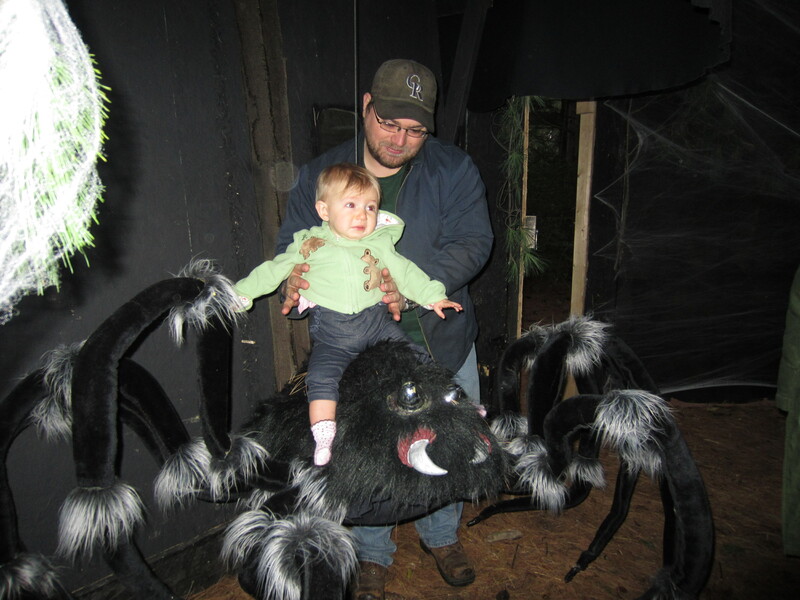 Big Mama has been the main spider for some time, knocking full adults to their knees in fright and causing several trail walkers to run, scream, and cry. I’m not going to lie…scaring people is really fun. We stand behind the walls and man the spiders, sometimes dropping them on people, and sometimes chasing them down for just long enough to get to desired scream. A lot of the success is built around the skinny tunnels and eerie sound effects, not to mention the crucial lighting techniques. When you see the scene in normal daylight, the spiders aren’t scary at all. It’s all about setting the mood. We brought Ginny out for a few hours while we were setting up, and then she left with her grandma after dinner. Of course, while she was there, we had to introduce her to our master of terror, Big Mama. Look how excited my father-in-law is about this! Unfortunately, Ginny wasn’t nearly as excited about the spider ride. I can’t say I was surprised. Even though Big Mama looks goofy in daylight, she still has an affect on kids. 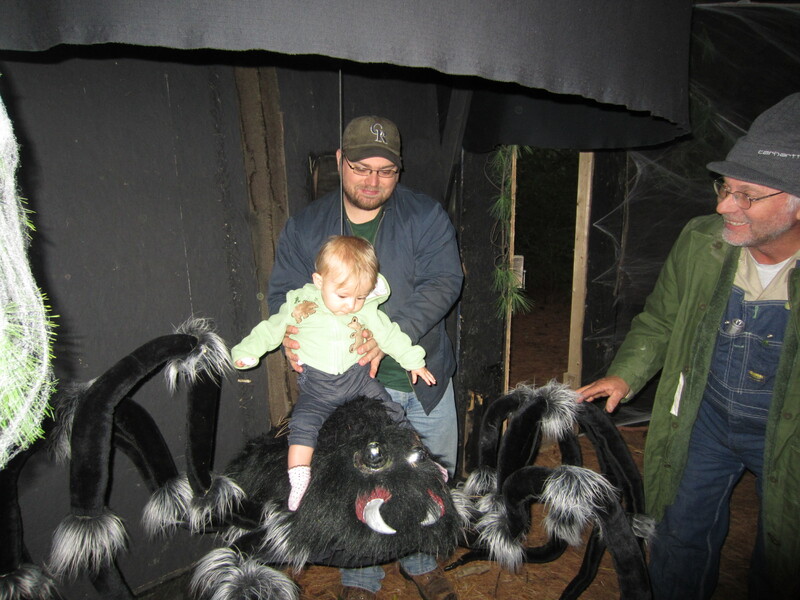 So, that was Ginny’s first Haunted Happenings spider fright experience. My brother-in-law didn’t hold her there long…really just until she started crying. Up until that point, she was really more or less confused. Sort of like, what is this thing? Like I said, we do this annually, so hopefully I’ll think to post about it beforehand next year, for anyone who wants to come and walk through the trail. Haunted Happenings is the Vermilion County Conservation District’s biggest fundraiser. We always have a ton of people show up (sometimes it’s even sold out). Some of the scenes are great, and some are goofy. Either way, I promise you’ll have a good time. We sure do. Next Next post: Happy Birthday Ginny!